The case of Hinneberg v Brannaghan  VSC 356 discusses the admissibility of evidence in drink-driving cases. The live issue was if the informant Senior Constable James Brannaghan had permission to enter a house, where he asked Mervyn Hinneberg to provide a preliminary breath sample. 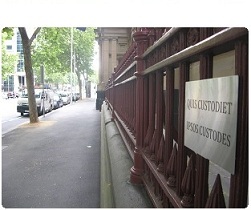 Senior Constable Brannaghan claimed an occupier of the house, Ms Lahogue, gave him permission to enter. She denied that at the Court hearing. (4) For the avoidance of doubt it is declared that nothing in this Part requires a person who is in a dwelling to allow a member of the police force or an officer of the Corporation to enter that dwelling without a warrant. The Chief Magistrate heard the case in the first instance. He wasn't satisfied that Ms Lahogue gave Senior Constable Brannaghan permission to enter her house. But he decided he would admit the evidence of the breath anaylsis certificate in the exercise of discretion under Bunning v Cross. The Supreme Court ruled that the Chief Magistrate resolved both issues incorrectly. In my opinion the Chief Magistrate applied an erroneous test in assessing the conflict between the evidence of Brannaghan and that of Ms Lahogue. The Chief Magistrate took the view, accepting submissions made to him on behalf of the defence that were not contradicted by the police prosecutor, that the onus was on the prosecution to prove that an invitation was issued to Brannaghan by Ms Lahogue to enter the house, and to prove it beyond reasonable doubt. However it is now common ground or virtually common ground that that was not the appropriate test, and that in fact the onus was on the defence to establish, on the balance of probabilities, the facts on which the defence relied in order to justify the exclusion of the evidence on the Bunning v Cross discretionary ground. Mr Tehan QC sought for a time to support the Chief Magistrate’s contrary approach by reliance on Liberato v Queen, but the relevant statements in that case relate to the obligation of the Crown to satisfy the court, beyond reasonable doubt, that the elements or ingredients of the offence have been made out. The position is quite different in relation to a submission that admissible evidence should be excluded as a matter of discretion on fairness or public policy grounds. I think that, in the end, Mr Tehan QC did not seriously contest that proposition. Was the breach of the law deliberate or inadvertent? Does the illegality affect the cogency of the evidence? How easy was it to comply with the law? What is the nature of the offence charged? Was the legislation intended to restrict or expand police interference with the liberty of the subject? So, although the analysis that I would apply is perhaps not completely in line with the submissions of either side, it seems to me that this is a case where it would be wrong to let the decision stand. The decision seems to have been arrived at from a fundamentally unsound original basis, namely the application of the beyond reasonable doubt test to the evidence in question. The application of that test was inapposite in the circumstances and it is not so surprising that it has led to the failure of the Chief Magistrate to make the findings that needed to be made in relation to the Bunning v Cross principles. The case was remitted to the Magistrates' Court for a fresh hearing.